THIS ITEM IS NOT AVAILABLE AT PRESENT. WE WILL NOT BE GETTING ANYMORE Star Wars Yumi Ashigaru Stormtrooper Meisho Movie Realization Action Figure. From the Star Wars collection by Bandai Tamashii Nations. 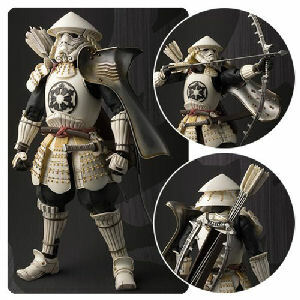 Star Wars Yumi Ashigaru Stormtrooper Meisho Movie Realization Action Figure. Includes 6 interchangeable hands - bow and arrow set - katana set - quiver. Bow folds out to be as tall as the archer. Ages 15 and up.